Getting the hang of making this Vietnamese dipping sauce (nước chấm) is an important step to making your cuisine just right. 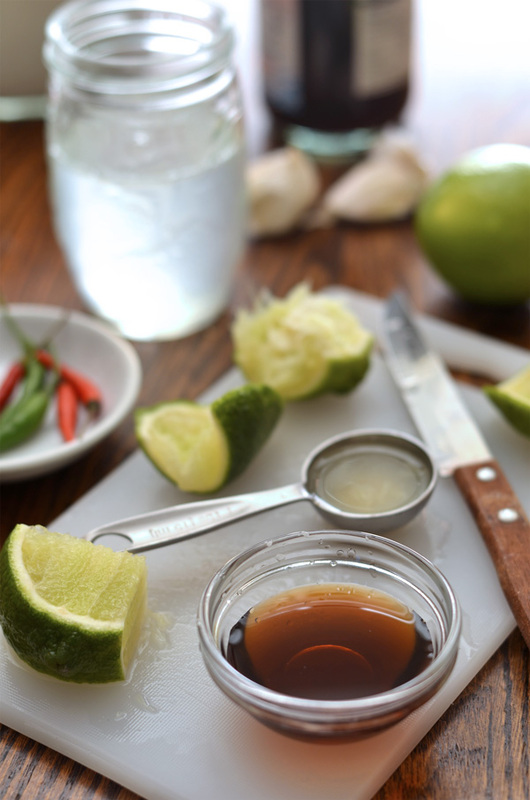 Since it’s just about everywhere in Vietnamese cooking, it’s simply referred to as “dipping sauce”. This is a dipping sauce I grew up with as a kid, with mom and grandma making this pretty often, for the dishes that specifically call for it, or sugarless versions of it just to dip boiled leafy veggies with (rau muống, or water spinach anyone?). They’d keep a stash of premixed sauce ready in the fridge for regular meals throughout the week, but when a special dish is being made, they’d make a fresh batch for the meal or for the day, and it definitely tastes better. I used the Three Crabs brand fish sauce. Depending on the kind you use, you will need to adjust the amount used due to sodium levels and flavor which can vary from brand to brand. 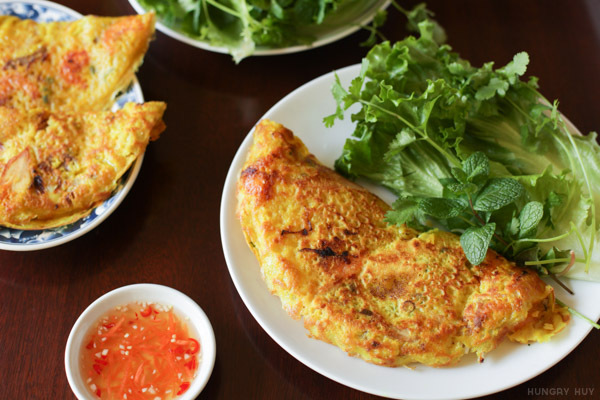 This nước chấm or fish sauce recipe is all about making it to fit your taste. Of course there other types of sauces Vietnamese people use for different foods, but this is the one primarily made with fish sauce. You’ll usually find a bowl of this sauce next to to foods like chả giò (egg rolls), spring rolls or summer rolls, bánh xèo, bánh hỏi, bánh cuốn, grilled meats such as in one of my favorites, bún thịt nướng (grilled pork with rice noodle and veggies), and fried fish just to scratch the surface. 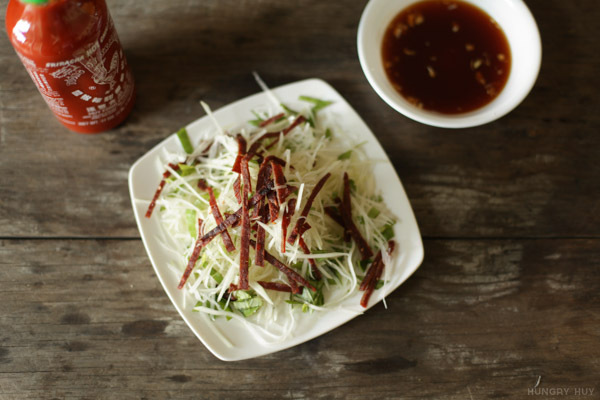 For different dishes there are slight variations on nước chấm, but we will use this as a base recipe that works great for most things. You can adjust it to your own taste if needed depending on what it’s going with. For example, local Vietnamese restaurants that sell roasted pork belly, will give you containers of this dipping sauce to go in Styrofoam cups that are SUPER sweet, at least to my taste. It verges on the realm of being syrup. But folks must love it for it to be the businesses’ mainstay. This is to say that you should also toy around with this recipe to land on ratios you like. Water – Keep in mind that about half the volume of this sauce is water. So if you’re trying to conserve ingredients, or just not make so much that wouldn’t get used, know that the volume of water you start with, will be doubled in the final sauce. Citrus – Start by mixing the water with sugar and lime or lemon. This is basically lemonade. If it’s too sweet, add some water. If it’s not sour enough add some more citrus. The flavor and acidity of lemon or limes can vary from fruit to fruit, so use your taste buds. Following this recipe exactly each time can produce different results since limes or lemons can vary in liquid, pulp, acidity, etc. But don’t even think about using bottled juice. That stuff tastes slightly muted, and missing that amazing fresh citrus oil scent that apparently doesn’t store well. 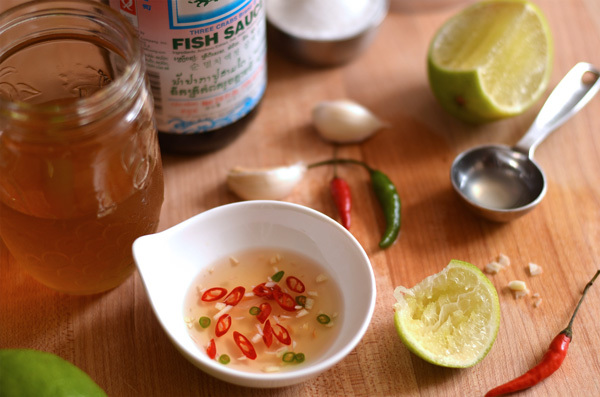 Fish sauce – Slowly add the fish sauce in increments until you gradually reach what the recipe calls for, all the while mixing the sauce and tasting it along the way. After you get used to making this, you can start to tell by the color of the sauce when you are getting close. Sugar – If you’re trying to dissolve sugar in cold water and it’s too cold it takes a lot longer to fully dissolve, and you can’t adjust ingredients as you go as accurately. Either use a small amount of hot or warm water enough to dissolve the sugar, then fill in the rest with cold or filtered tap water. Or if you want to get fancy, make a simple syrup by heating equal parts sugar and water in a pot over medium heat until fully dissolved. If you use 1 cup sugar, 1 cup water, you’ll end up with about 1.5 cups of simple syrup. You can save the rest for making cocktails! Optional additions – Add chopped chilies or finely chopped garlic to the sauce if you like. Chiles are a must for me, and garlic is nice too. Finely chopping garlic is a very time consuming task if you’re doing it manually. If I’m doing it in bulk, I’ll throw them into a mini food processor, but if it’s just a few I love my garlic press as it’s a huge time saver, and easier to wash than the food processor. 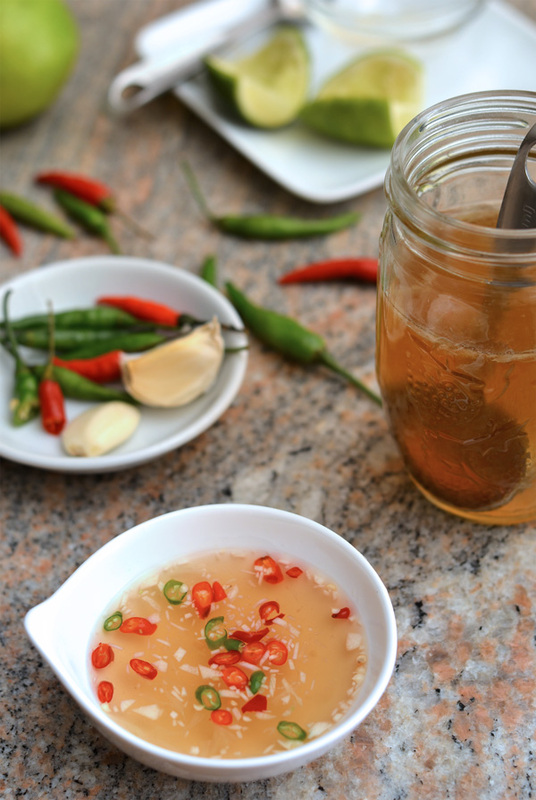 If you live in a household in which each person is going to be picky about their nước chấm, having a mellow base dipping sauce is ideal for that. They can adjust in their own bowls if they want extra fish sauce, lime, sugar, chilies or garlic. You can keep in an airtight jar in the fridge as you work through it, but I prefer to make it fresh for each meal. Sometimes you’ll see people put their own twists on this recipe. It’s all about making it your own. I’ve seen some recipes that swap out sugar for some other juices. In restaurants this is made in big batches. They’ll typically use vinegar for bite instead of lemons since it’s easier and cheaper. Also, restaurants will not always want to bother finely chopping garlic for your dipping sauce. This is one you can easily add yourself at home. 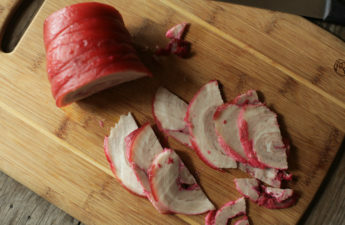 If you’re looking to try this sauce out I recommend trying my recipe for Vietnamese grilled pork and rice noodle bowls. Let me know what you think about the sauce in a comment below, and thanks for reading! An simple yet delicious recipe for Vietnamese dipping sauce or nước chấm. Make sure to taste as you go and adapt to your own liking. Combine water and sugar in a bowl. My mom makes a simple syrup, boiling the sugar and water first and for some reason it taste so much better because the sugar completely dissolves. 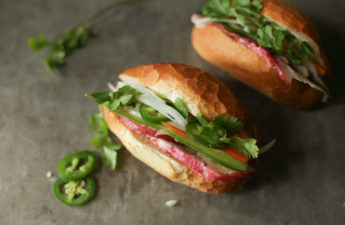 Hi Huy, delicious recipes. Thank you for sharing. Thank you Alicia, I’m glad you find them useful! It’s so great to find your wonderful (and alluring) blog. There are so many different recipes for dipping sauce in Vietnam. The one I like best is smashing some garlic, chilli with sugar, add lime juice, add some water (only if I want diluted sauce for Bún or Rolls), then some fish sauce. I like to crush garlic and chilli at first because it adds a strong taste to the sauce, which is really great when combining with other food. Just want to share my favorite recipe with you. Your blog is SUCH a gem, and I am so happy to have stumbled across it! You have some amazing Vietnamese dishes here (and have covered all of my favs, like bun bo hue & banh xeo)! Thanks for this simple recipe! I make a batch with just the lime, water, and sugar, and we add garlic/chilli per individual’s taste. Yup it can be pretty easy once you know how it’s supposed to taste. I was completely lost without trying a recipe, despite having eaten this a lot. Thanks for sharing and let me know if you have any questions about recipes you try! 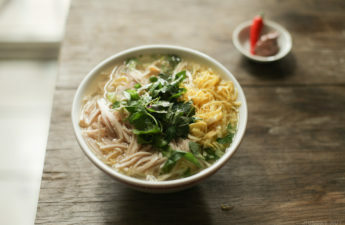 On a trip to Vietnam past May I simply fell in love with everything the Vietnamese kitchen has to offer. Stumbling over your blog after my travels have ended may have been one of the best things to happen to me since! Also, this recipe is one of the essentials, I feel. There’s barely any food that isn’t served with this sauce in (south) Vietnam. Glad to hear you enjoyed Vietnam Ben! Yeah many dishes would be lacking without this sauce. Having toured around Vietnam and eating a lot of vietnamese in Sydney, and tried a bunch of recipes from different books, this is by far THE BEST recipe for this dipping sauce I have ever tasted. the lime totally makes it. What an awesome compliment Debbie, I’m glad you liked it! I often notice different ratios being used, and even sub for lemons for specific dishes can work well too. I usually use freshly squeezed lime, water, sugar, garlic, and a small pepper. I think it’s common sense not to use the pre-squeezed lime/lemon juice out of those plastic squeeze bottles, but having read your post…I can’t help but wonder if there is any validity to it? If restaurants use vinegar…then what’s so bad about using the bottled juice? You inspired me to test this out. I think I will make a batch out of the bottled juice for my family and do a taste test. Fantastic recipe, by the way! Hello! I’ve tried to make this sauce many times with no luck and friends tell me it’s the brand of fish sauce I use… I’m wondering what brand of fish sauce you use? Wow. This was incredibly informative, and with a tasty result! I was sufficiently naive to think, oh, fish sauce? I like it! So I bought some, put it in a bowl, and about gagged. This was a long time ago. But this recipe is excellent, and worked really well. Thank you! !